You see those little green spots in your aquarium? Kinda looks like green chicken pox, right? Well, that’s actually green spot algae. And today, I am going to show you how to get rid of it. What is green spot algae and how do you identify it? Will green spot algae harm your fish? Will green spot algae harm your plants? What causes green spot algae to appear? How do you get rid of green spot algae? Green spot algae is named for what it looks like – small, circular green spots. Unlike most other algae, green spot algae doesn’t grow tall. In fact, it’s almost flat and hard to the touch. Green spot algae commonly grows on objects that don’t move – substrate, rocks, driftwood and even the glass of your aquarium. If you have a slow-growing plant, then green spot algae will also happily grow on that too, where it will appear as dark green spots. 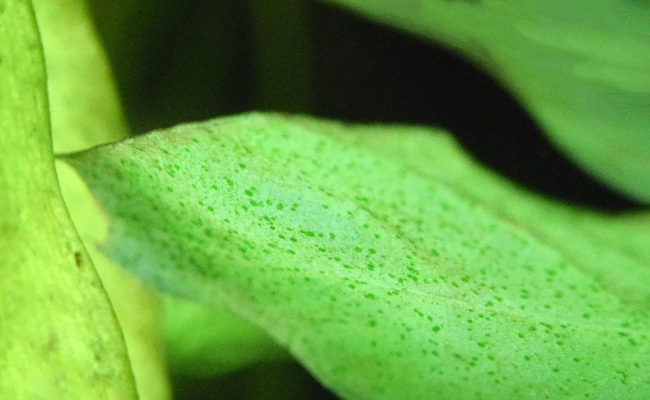 You might notice the dreaded green spots first in the brightly lit areas of your tank. That’s no surprise, as I will cover later this guide. Too much light is actually one cause of green spot algae. In its early stages, this algae appears as isolated spots. If you are not looking for it, it can easily be missed. Most people first notice the spots on the glass of their aquarium since it blocks their view. 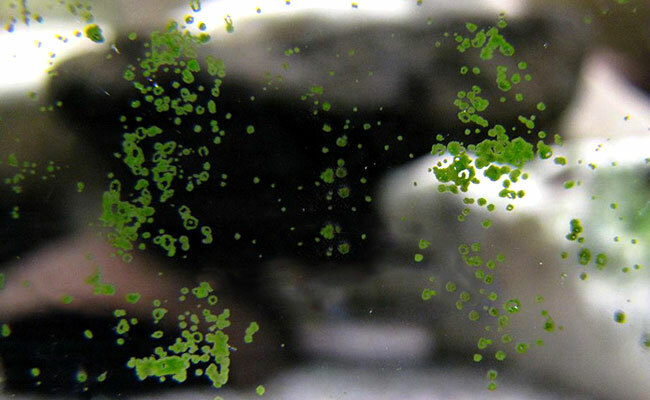 The green spots look a lighter shade of green on the glass of your aquarium. This is because the light hits the algae from both sides, making it appear lighter. If left to grow, the spots will merge together forming a blotchy carpet. When this happens, it doesn’t really look like spots at all. Fortunately, you should have noticed the small green spots appear well before this happens. Green spot algae is often confused with green dust algae. While the two look similar, when compared side by side, the differences become obvious. Green spot algae grows in distinct circular shapes that slowly merge together. Green dust algae, on the other hand, is so fine that it resembles… well… dust. Still can’t tell the two apart? Use your finger! If the algae easily lifts off with the gentlest of touches, you have green dust algae. If it’s stubborn, you have green spot algae. No, green spot algae is harmless to your fish. In fact, some curious herbivores might even nibble on it. Yes, but only if it you let it completely cover your plants. And to be fair, you should have dealt with the outbreak well before this happens. If left to do its own thing, the green spot algae will eventually cover your entire plant, blocking any light from reaching it. And as you know, plants need light for energy. But as for a few spots? I wouldn’t consider green algae to be a major threat to your plant. Like with most algae, a nutrient imbalance is the cause. Many experts agree that the following two factors play the biggest role in the appearance of green spot algae. 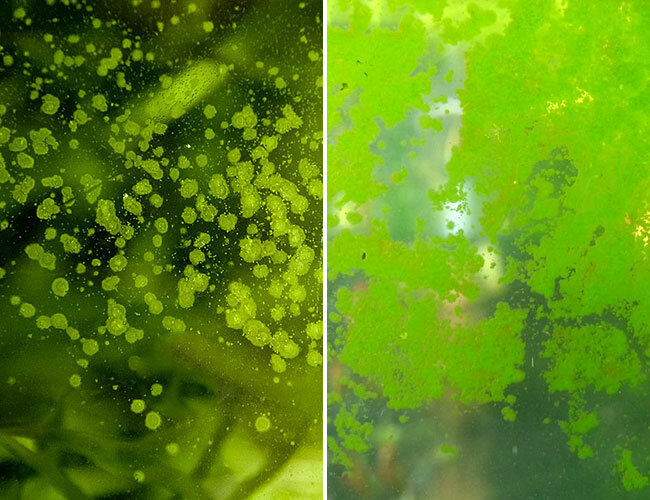 Like with many other types of algae, high levels of light, either from a nearby window or from your aquarium light, can be responsible for a green spot algae outbreak. Fixing your light levels is the easiest way to prevent green spot algae from appearing in your tank. You can reduce how long your aquarium lights stay on by using a reliable plug-in aquarium timer. 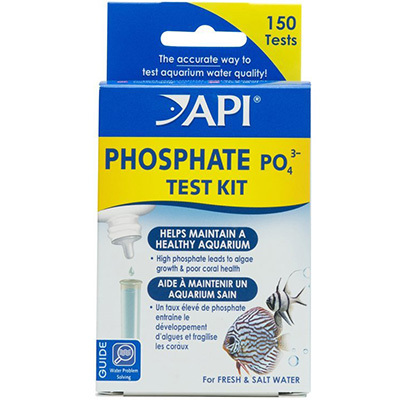 Unfortunately, you can’t tell your phosphate levels just by looking at your aquarium. To do that, you need a special water test known as an aquarium test kit – one designed specifically to analyze phosphates. If your phosphate levels are near zero, then it’s likely that this is the cause of your green spot algae. Oh, so your phosphate levels are at zero? Well, getting rid of your green spot algae could be as simple as adding a source of phosphates, like this one. Don’t expect your green spot algae to disappear the very moment that you add phosphates. It’s a slow process, and may take weeks before it begins to recede. How to get rid of green spot algae? Once you have dealt with the cause, it’s time to look at how you can remove these ugly spots from your aquarium. When it comes to removing algae from the glass of your aquarium, there really isn’t a better option than scraping it off. But don’t worry! You don’t need to buy another product to remove your green spot outbreak. In fact, the solution is actually what you buy products with. I am talking about your credit card. Don’t have an old credit card on hand? Any other similarly sized plastic card will work just as well. Now, you’re going to have to get your hands wet for this next bit. Angle your credit card and slide it down the glass of your aquarium – you should see the green spot algae lift off, as if by magic. 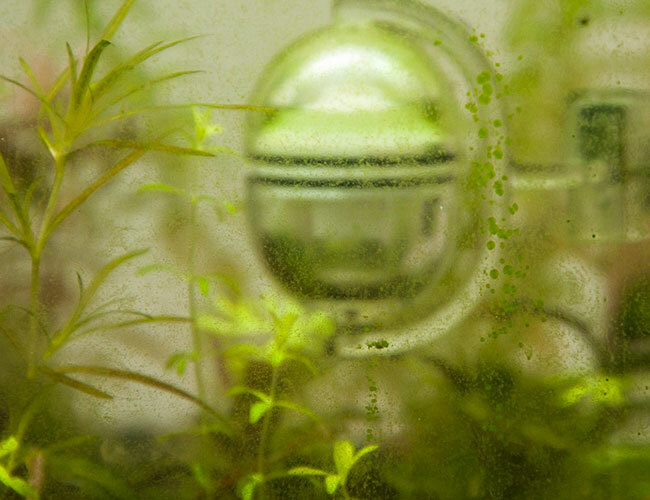 Keep swiping until you have removed all visible signs of green spot algae from your aquarium glass. Once done, perform a water change to perform to help remove any gunk that you scraped into the tank. 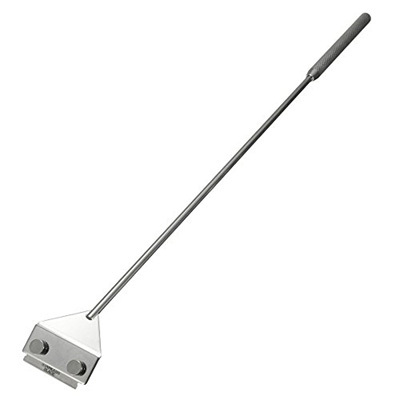 Essentially, this is a razorblade on a stick and will easily scrape off your green spot algae and keep your hands dry too. Or, ditch the razorblade and attach your credit card to the algae scraper. It’s as simple as drilling two small holes in your credit card. This way, you can remove green spot algae without worrying that you will tear your silicone seal. Even so, I still advise being gentle. To remove green spot algae from your plants, your best option is to cut off each leaf that is covered. As for rocks and driftwood? Take them out of your tank and scrub them with a rough sponge – a hydrogen peroxide solution will kill any pieces that you can’t scrape off. This hungry fellow has an appetite for green spot algae. Whether it’s on your glass, plants, driftwood or rocks, the Nerite will hunt it down and eat it up. Sure, other algae eaters might give it a little nibble, but because green spot algae is hard, it takes a lot of effort for it to be a good meal. 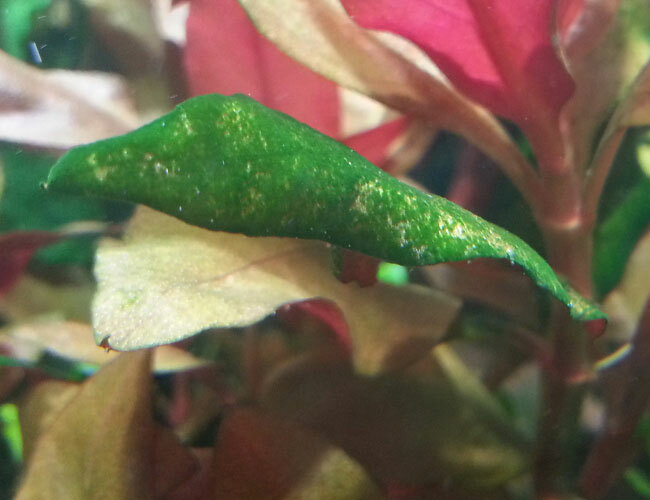 Most algae eaters give up and look for an easier feed. 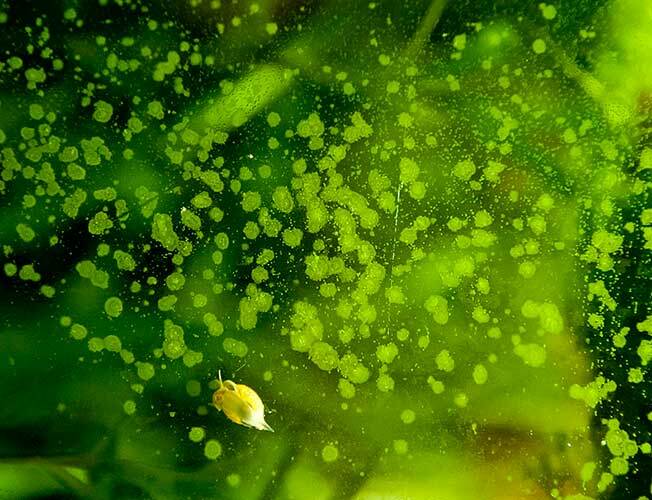 If you let your green spot algae problem grow out of control, you may need multiple Zebra Nerite Snails – a single snail can only eat so much! Oh, and remember that any algae eater that you add to your tank is going to become an extra mouth to feed. Once your Zebra Nerite has removed all the green spot algae from your aquarium, it will no longer have a food source. And, if you don’t feed your snail, it will starve. 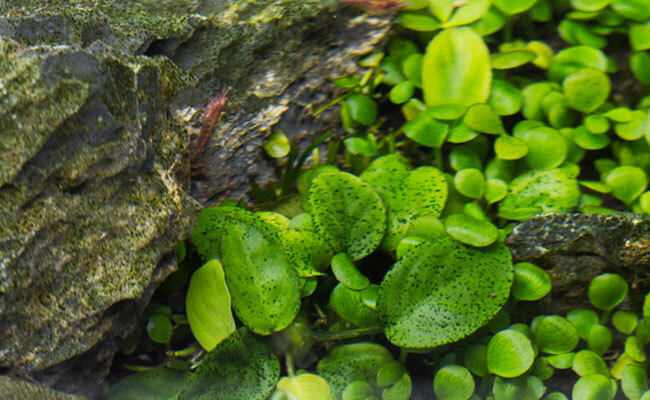 Green spot algae is one of the more gentle algae that can visit your aquarium. It’s an eyesore, but it’s easy to get under control. Some people even allow green spot algae to accumulate in their aquarium because they like the look of it. And, that’s just fine too. But if you are like most people, you want it gone so that it doesn’t distract you from the awesome aquascape that you spent hours creating. 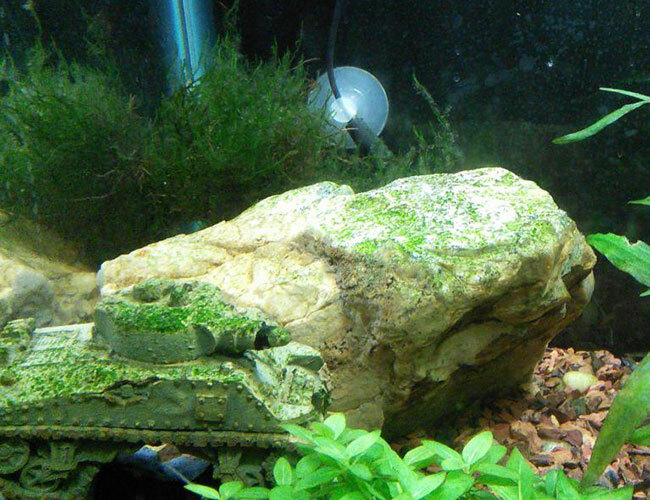 How did you get rid of green spot algae in your aquarium? Let me know in the comments below! Very helpful. I thought I was dealing with green dust algae.